The Sheltowee Traveler is the ultimate experience offering the minimalist approach to enjoying nature's beauty. This shelter is the perfect luxury getaway for those who like camping but wish for a sturdier and more comfortable place to stay. Our Sheltowee Traveler cabin offers the perfect combination of modern amenities with the simple way of living. Please note that you must hike 1/4 mile to access this shelter. The first cabin my husband and I built together, it truly is a couple's woodsy retreat, a super spot for a friendly campfire, or an excellent challenge for folks wanting to get off the beaten path. 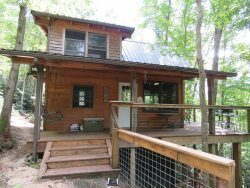 The only way to access this one room retreat is by hiking approximately 1/4 mile, uphill, from our main office on a private trail built specifically to access this cabin. The trail is graveled and easy to find and follow, but the work in getting up is SO worth the view and privacy of this hillside spot. There is a small kitchenette with a dorm size fridge, built in table and benches that can accommodate up to four. A futon and rocking chair in the living room, and a built in queen size bed. The cabin can sleep up to four, with two on the main queen bed, one on the full size futon and one on the twin size floor mattress, which tucks under the main bed when not in use. The front porch overlooks your fire ring and you have an excellent view of Peregrine Rock across the valley. There is a tiny second balcony, which is screened in and is the perfect place for a quiet read or maybe a romantic moment. Kitchen: Sheltowee’s kitchen has a gas stove, mini-fridge, double sink, coffee pot, cookware, dishware, soap and kitchen linens. Above the sink you’ll find a 5-gallon water dispenser for your cooking and cleaning needs. We supply two 5-gallon jugs of potable water during your stay. Living/Dining: The kitchen area has a small table for two. There is also a futon couch and two porches. Enjoy the view! Bathroom: The composting outhouse is a stone’s throw from Sheltowee. You are also welcome to use the guest shower and bathroom at our headquarters at any time during your stay. Bedroom: Queen bed, pull-out twin mattress and a full futon. Pillows are provided. Additional Amenities: Weber charcoal grill, window AC and ceiling fan, wall heater and a space heater, covered porch and private fire pit.